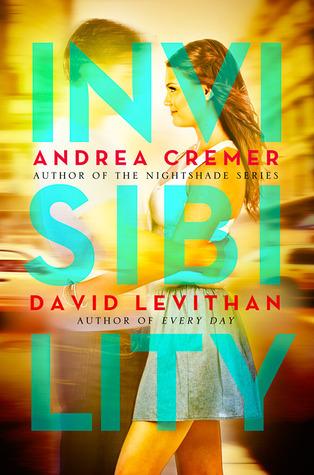 Invisibility is about a boy named Stephen who has been invisible his entire life. His grandfather is a cursecaster and placed the curse on his mother well before he was conceived. Nobody has ever been able to see him until Elizabeth moves into his building. He starts to get his hopes up that the curse may be wearing off, but he quickly discovers that others are still not able to see him. But why can Elizabeth see him? That is the BIG unanswered question. I enjoyed seeing how Stephen's life changed once he could actually engage with the world. While it was a shock to Elizabeth when she found out he was invisible, it allowed Stephen to become friends with her brother Laurie, who is the go-getter in the group. If it weren't for Laurie, the book probably would have come to an abrupt half less than halfway through. Laurie decides that they need to set out on a quest to uncover the truth behind Stephen's curse with the hopes of finding a cure. The rest of the book is a whirlwind of bad magic. Stephen's grandfather arrives in New York and there are evil curses showing up everywhere. Not just the petty curses the spellseekers are used to seeing in New York, but much bigger things that rival Stephen's curse. Elizabeth meets an older woman with abilities similar to hers, but not nearly as powerful. The woman teaches her the history of spellseekers and cursecasters while helping her hone her skills. The book culminates with an epic battle, but the ending was a huge disappointment. After everything Elizabeth, Stephen, and Laurie went through, I was expecting a certain ending. The authors left a sense of hope for the future, but in this case, I think they needed to spell it out. I debated between 2 and 3 stars and decided to go with 3 simply because it wasn't as disappointing as the other books I have already given 2 stars. On the other hand...it wasn't nearly as good as some of the books I have given 3 stars. I really wish Goodreads would allow 1/2 stars because this book is definitely more of a 2.5 than a 3.